The PCT (Process Cycle Test) component of COVER delivers test cases for the coverage type: Paths (=Coverage of the variations in the process in terms of combinations of paths). In the coverage of paths, various levels are possible. The more thorough the level, the greater the probability of finding defects. The depth of coverage is reflected in the concept of test depth level. The default version of the PCT component delivers the commonly used test depth levels: 1 and 2. Higher test depth levels (3, 4, 5, etc..) are possible in advanced PCT profiles. 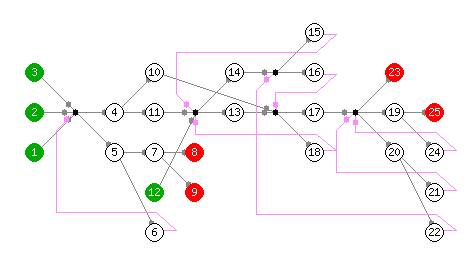 This file is used for a quick check on all connections between shapes in the process flow, when a "connection error" occurs, an extra (green) start and (red) end path is introduced in the graph. (unfortunately in MsVisio a "connection error" between an arrow and shape is made easily). Blue filled circles (not in this example) represent the start points of parallel paths. Input: a list of the path combinations with text content and connection labels (tool interpretation of the input). - are all paths covered in the test depth level 1 test cases? - are all path combinations covered in the test depth level 2 test cases.